Current genome-editing technologies introduce double-stranded (ds) DNA breaks at a target locus as the first step to gene correction1, 2. Although most genetic diseases arise from point mutations, current approaches to point mutation correction are inefficient and typically induce an abundance of random insertions and deletions (indels) at the target locus resulting from the cellular response to dsDNA breaks1, 2. Here we report the development of ‘base editing’, a new approach to genome editing that enables the direct, irreversible conversion of one target DNA base into another in a programmable manner, without requiring dsDNA backbone cleavage or a donor template. We engineered fusions of CRISPR/Cas9 and a cytidine deaminase enzyme that retain the ability to be programmed with a guide RNA, do not induce dsDNA breaks, and mediate the direct conversion of cytidine to uridine, thereby effecting a C→T (or G→A) substitution. The resulting ‘base editors’ convert cytidines within a window of approximately five nucleotides, and can efficiently correct a variety of point mutations relevant to human disease. In four transformed human and murine cell lines, second- and third-generation base editors that fuse uracil glycosylase inhibitor, and that use a Cas9 nickase targeting the non-edited strand, manipulate the cellular DNA repair response to favour desired base-editing outcomes, resulting in permanent correction of ~15–75% of total cellular DNA with minimal (typically ≤1%) indel formation. Base editing expands the scope and efficiency of genome editing of point mutations. The CRISPR/Cas9 technique is revolutionizing genetic research: scientists have already used it to engineer crops, livestock and even human embryos, and it may one day yield new ways to treat disease. But now one of the technique’s pioneers thinks that he has found a way to make CRISPR even simpler and more precise. In a paper published in Cell on 25 September, a team led by synthetic biologist Feng Zhang of the Broad Institute in Cambridge, Massachusetts, reports the discovery of a protein1 called Cpf1 that may overcome one of CRISPR/Cas9’s few limitations; although the system works well for disabling genes, it is often difficult to truly edit them by replacing one DNA sequence with another. The CRISPR/Cas9 system evolved as a way for bacteria and archaea to defend themselves against invading viruses. It is found in a wide range of these organisms, and uses an enzyme called Cas9 to cut DNA at a site specified by ‘guide’ strands of RNA. Researchers have turned CRISPR/Cas9 into a molecular-biology powerhouse that can be used in other organisms. The cuts made by the enzyme are repaired by the cell’s natural DNA-repair processes. CRISPR is much simpler than previous gene-editing methods, but Zhang thought there was still room for improvement. So he and his colleagues searched the bacterial kingdom to find an alternative to the Cas9 enzyme commonly used in laboratories. In April, they reported that they had discovered a smaller version of Cas9 in the bacterium Staphylococcus aureus2. The small size makes the enzyme easier to shuttle into mature cells — a crucial destination for some potential therapies. The team was also intrigued by Cpf1, a protein that looks very different from Cas9, but is present in some bacteria with CRISPR. The scientists evaluated Cpf1 enzymes from 16 different bacteria, eventually finding two that could cut human DNA. They also uncovered some curious differences between how Cpf1 and Cas9 work. 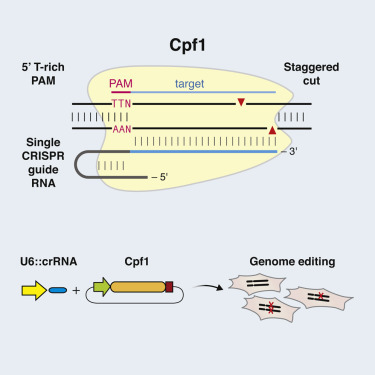 Cas9 requires two RNA molecules to cut DNA; Cpf1 needs only one. The proteins also cut DNA at different places, offering researchers more options when selecting a site to edit. “This opens up a lot of possibilities for all the things we could not target before,” says epigeneticist Luca Magnani of Imperial College London. Cpf1 also cuts DNA in a different way. Cas9 cuts both strands in a DNA molecule at the same position, leaving behind what molecular biologists call ‘blunt’ ends. But Cpf1 leaves one strand longer than the other, creating a ‘sticky’ end. Blunt ends are not as easy to work with: a DNA sequence could be inserted in either end, for example, whereas a sticky end will only pair with a complementary sticky end. Zhang’s team is now working to use these sticky ends to improve the frequency with which researchers can replace a natural DNA sequence. Cuts left by Cas9 tend to be repaired by sticking the two ends back together, in a relatively sloppy repair process that can leave errors. Although it is possible that the cell will instead insert a designated, new sequence at that site, that kind of repair occurs at a much lower frequency. Zhang hopes that the unique properties of how Cpf1 cuts may be harnessed to make such insertions more frequent. Will the new enzyme surpass Cas9 in popularity? “It’s too early to tell,” says Zhang. “It certainly has some distinct advantages.” The CRISPR/Cas9 system is so popular — and potentially lucrative — that it has sparked a fierce patent fight between the University of California, Berkeley, and the Broad Institute and its ally, the Massachusetts Institute of Technology in Cambridge. Zhang says that his lab will make the CRISPR/Cpf1 components available to academic researchers, as it has done with its CRISPR/Cas9 tools. Zetsche, B. et al. Cell http://dx.doi.org/10.1016/j.cell.2015.09.038 (2015). CRISPR–Cas systems that provide defence against mobile genetic elements in bacteria and archaea have evolved a variety of mechanisms to target and cleave RNA or DNA1. The well-studied types I, II and III utilize a set of distinct CRISPR-associated (Cas) proteins for production of mature CRISPR RNAs (crRNAs) and interference with invading nucleic acids. In types I and III, Cas6 or Cas5d cleaves precursor crRNA (pre-crRNA)2, 3, 4, 5 and the mature crRNAs then guide a complex of Cas proteins (Cascade-Cas3, type I; Csm or Cmr, type III) to target and cleave invading DNA or RNA6, 7, 8, 9, 10, 11, 12. In type II systems, RNase III cleaves pre-crRNA base-paired withtrans-activating crRNA (tracrRNA) in the presence of Cas9 (refs 13, 14). The mature tracrRNA–crRNA duplex then guides Cas9 to cleave target DNA15. Here, we demonstrate a novel mechanism in CRISPR–Cas immunity. We show that type V-A Cpf1 from Francisella novicida is a dual-nuclease that is specific to crRNA biogenesis and target DNA interference. Cpf1 cleaves pre-crRNA upstream of a hairpin structure formed within the CRISPR repeats and thereby generates intermediate crRNAs that are processed further, leading to mature crRNAs. After recognition of a 5′-YTN-3′ protospacer adjacent motif on the non-target DNA strand and subsequent probing for an eight-nucleotide seed sequence, Cpf1, guided by the single mature repeat-spacer crRNA, introduces double-stranded breaks in the target DNA to generate a 5′ overhang16. The RNase and DNase activities of Cpf1 require sequence- and structure-specific binding to the hairpin of crRNA repeats. Cpf1 uses distinct active domains for both nuclease reactions and cleaves nucleic acids in the presence of magnesium or calcium. This study uncovers a new family of enzymes with specific dual endoribonuclease and endonuclease activities, and demonstrates that type V-A constitutes the most minimalistic of the CRISPR–Cas systems so far described. Recently, there has been extensive interest in the cancer research and oncology community on detecting those mutations responsible for the initiation and propagation of a neoplastic cell (driver mutations) versus those mutations that are randomly (or by selective pressures) acquired due to the genetic instability of the transformed cell. The impact of either type of mutation has been a topic for debate, with a recent article showing that some passenger mutations may actually be responsible for tumor survival. In addition many articles, highlighted on this site (and referenced below) in recent years have described the importance of classifying driver and passenger mutations for the purposes of more effective personalized medicine strategies directed against tumors. Two review articles by Mike Martin in the Journal of the National Cancer Institute (JCNI) shed light on the current efforts and successes to discriminate between these passenger and driver mutations and determine impact of each type of mutation to tumor growth. However, as described in the associated article, the picture is not as clear cut as previously thought and highlights some revolutionary findings. In Rewriting the Mathematics of Tumor Growth, researchers discovered that driver mutations may confer such a small growth advantage that, multiple mutations, including the so called passenger mutations are necessary in order to sustain tumor growth. In fact, much experimental evidence has suggested at least six defined genetic events may be necessary for the in-vitro transformation of human cells. The following table shows some of the genetic events required for in-vitro transformation in cell culture systems. Note: priming means events required to immortalize but not fully transform. * Note that both ability to form colonies in soft agarose and subsequently tested for tumor formation in immunocompromised mice. a. Hahn, W. C., Counter, C. M., Lundberg, A. S., Beijersbergen, R. L., Brooks, M. W., and Weinberg, R. A. (1999) Creation of human tumour cells with defined genetic elements, Nature 400, 464-468.
b. Kendall, S. D., Linardic, C. M., Adam, S. J., and Counter, C. M. (2005) A network of genetic events sufficient to convert normal human cells to a tumorigenic state, Cancer Res 65, 9824-9828.
c. Sun, B., Chen, M., Hawks, C. L., Pereira-Smith, O. M., and Hornsby, P. J. (2005) The minimal set of genetic alterations required for conversion of primary human fibroblasts to cancer cells in the subrenal capsule assay, Neoplasia 7, 585-593.
d. Rangarajan, A., Hong, S. J., Gifford, A., and Weinberg, R. A. (2004) Species- and cell type-specific requirements for cellular transformation, Cancer Cell 6, 171-183.
e. Goessel, G., Quante, M., Hahn, W. C., Harada, H., Heeg, S., Suliman, Y., Doebele, M., von Werder, A., Fulda, C., Nakagawa, H., Rustgi, A. K., Blum, H. E., and Opitz, O. G. (2005) Creating oral squamous cancer cells: a cellular model of oral-esophageal carcinogenesis, Proc Natl Acad Sci U S A 102, 15599-15604.
f. Sasaki, R., Narisawa-Saito, M., Yugawa, T., Fujita, M., Tashiro, H., Katabuchi, H., and Kiyono, T. (2009) Oncogenic transformation of human ovarian surface epithelial cells with defined cellular oncogenes, Carcinogenesis 30, 423-431.
g. Liu, J., Yang, G., Thompson-Lanza, J. A., Glassman, A., Hayes, K., Patterson, A., Marquez, R. T., Auersperg, N., Yu, Y., Hahn, W. C., Mills, G. B., and Bast, R. C., Jr. (2004) A genetically defined model for human ovarian cancer, Cancer Res 64, 1655-1663.
h. Kusakari, T., Kariya, M., Mandai, M., Tsuruta, Y., Hamid, A. A., Fukuhara, K., Nanbu, K., Takakura, K., and Fujii, S. (2003) C-erbB-2 or mutant Ha-ras induced malignant transformation of immortalized human ovarian surface epithelial cells in vitro, Br J Cancer 89, 2293-2298.
i. Hirakawa, T., and Ruley, H. E. (1988) Rescue of cells from ras oncogene-induced growth arrest by a second, complementing, oncogene, Proc Natl Acad Sci U S A 85, 1519-1523.
j. Orsulic, S., Li, Y., Soslow, R. A., Vitale-Cross, L. A., Gutkind, J. S., and Varmus, H. E. (2002) Induction of ovarian cancer by defined multiple genetic changes in a mouse model system, Cancer Cell 1, 53-62.
k. Adam, S. J., Rund, L. A., Kuzmuk, K. N., Zachary, J. F., Schook, L. B., and Counter, C. M. (2007) Genetic induction of tumorigenesis in swine, Oncogene 26, 1038-1045. However it may be argued that the aforementioned experimental examples were produced in cell lines with a more stable genome than that which is seen in most tumors and had used traditional assays of transformation, such as growth in soft agarose and tumorigenicity in immunocompromised mice, as endpoints of transformation, and not representative of the tumor growth seen in the clinical setting. This model was based on a combination of experimental data and computer simulations of gliobastoma multiforme and pancreatic adenocarcinoma. Most tumor models follow a Gompertz kinetics, which show how tumor growth is exponential but eventually levels off over time. This new theory shows though that a tumor cell with only one driver mutation can only grow so much, until a second driver mutation is required. Using data for the COSMIC database (Catalog of Somatic Mutations in Cancer) together with analysis software CHASM (Cancer-specific High-throughput Annotation of Somatic Mutations) the researchers analyzed 713 mutations sequenced from 14 glioma patients and 562 mutations in nine pancreatic adenocarcinomas, revealing at least 100 tumor suppressor genes and 100 oncogenes altered. Therefore, the authors suggested these may be possible driver mutations, or at least mutations required for the sustained growth of these tumors. Applying this new model to data obtained from Dr. Giardiello’s publication concerning familial adenopolypsis in New England Journal of medicine in 19993 and 2000, the sequential driver mutation model predicted age distribution of FAP patients, number and size of polyps, and polyp growth rate than previous models. This surprising number of required driver mutations for full transformation was also verified in a study led by University of Texas Southwestern Medical Center biologist Jerry Shay, Ph.D., who noted “this team’s surprise nearly 45% of all colorectal candidate oncogenes (65 mutations) drove malignant proliferation”. However, some investigators do not believe the model is complex enough to account for other factors involved in oncogenesis, such as epigenetic factors like methylation and acetylation. In addition the review also discusses host and tissue factors which may complicate the models, such as location where a tumor develops. However, most of the investigators interviewed for this review agreed that focusing on this long-term progression of the disease may give us clues to other potential druggable targets. A related review from Mike Martin in JNCI  describes a statistical method, published in 2009 Cancer Informatics, which distinguishes chromosomal abnormalities that can drive oncogenesis from passenger abnormalities. Chromosomal abnormalities, such as deletions, additions, and translocations are common in cancer. For instance, the well-known Philadelphia chromosome, a translocation between chromosome 9 and 22 which results in the BCR-ABL tyrosine kinase fusion protein is the molecular basis of chronic myelogenous leukemia. Another method to sort the most “important” chromosomal aberrations from less relevant alterations is termed GISTIC, as the website describes is: a tool to identify genes targeted by somatic copy-number alterations (SCNAs) that drive cancer growth (at the Broad Institute website http://www.broadinstitute.org/software/cprg/?q=node/31). The method allows for comparison across multiple tumors so noise is eliminated and improves consistency of analysis. This method had been successfully used to determine driver aberrations is mesotheliomas, leukemias, and identify new oncogenes in adenocarcinomas of the lung and squamous cell carcinoma of the esophagus. 1. Martin M: Rewriting the mathematics of tumor growth. Journal of the National Cancer Institute 2011, 103(21):1564-1565. 2. Martin M: Aberrant chromosomes: teams use math models to sort drivers from passengers. Journal of the National Cancer Institute 2010, 102(6):369-371. 3. Eskiocak U, Kim SB, Ly P, Roig AI, Biglione S, Komurov K, Cornelius C, Wright WE, White MA, Shay JW: Functional parsing of driver mutations in the colorectal cancer genome reveals numerous suppressors of anchorage-independent growth. Cancer research 2011, 71(13):4359-4365. 4. Shay T, Lambiv WL, Reiner-Benaim A, Hegi ME, Domany E: Combining chromosomal arm status and significantly aberrant genomic locations reveals new cancer subtypes. Cancer informatics 2009, 7:91-104. 5. Beroukhim R, Getz G, Nghiemphu L, Barretina J, Hsueh T, Linhart D, Vivanco I, Lee JC, Huang JH, Alexander S et al: Assessing the significance of chromosomal aberrations in cancer: methodology and application to glioma. Proceedings of the National Academy of Sciences of the United States of America 2007, 104(50):20007-20012. Mosaicism’ is Associated with Aging and Chronic Diseases like Cancer: detection of genetic mosaicism could be an early marker for detecting cancer. progression. Nature Reviews Cancer 4, 197-205. Crespi B and Summers K (2005) Evolutionary biology of cancer. Trends in Ecology and Evolution 20, 545-552.
process. Nature Reviews Cancer 6, 924-935. Hold on. Mutations in Cancer do good. The findings, reported in this week’sProceedings of the National Academy of Sciences, suggest that cancer should be viewed as an evolutionary process whose course is determined by a delicate balance between driver-propelled growth and the gradual buildup of passenger mutations that are damaging to cancer, says Leonid Mirny, an associate professor of physics and health sciences and technology at MIT and senior author of the paper. Current post talks about a new technique that has been introduced by the authors as a ‘Comprehensive 1-Step Molecular Analyses of Mitochondrial Genome by Massively Parallel Sequencing’. The technique was recently published in the Clinical Chemistry journal (2012) by Zhang et al. One mitochondria may have multiple copies of mtDNA and an interesting feature observed in mitochondria is the heteroplasmy, a phenomenon where mutant and wild-type mtDNA can co-exist. During cell division, the mutant and wild-type copies are distributed randomly in daughter cells. The impact is in the heterogeneity with respect to penetrance and expressivity along that has diverse manifestations in terms of organs being affected, age of onset and the rate of progression. With such variability, the diagnosis becomes even more challenging. Therefore, mutational analysis along with accurate heteroplasmy detection in the mtDNA is an important part of the diagnosis. Thus, there is need for accurate and faster mutation detection methods for patients that are suspected to carry a mitochondrial disease. The current molecular diagnostic methods for the detection of mtDNA mutations involves several different and complimentary methods. The detection of mutations is approached by first screening for a panel of point mutations that have been commonly associated with the mitochondrial diseases, followed by the quantification of the mutant load. In case none of the point mutations show up in the screening, the whole genome sequencing of mtDNA is performed to identify rare or novel mutations that might be associated with the disease. Also, in order to analyze large deletions within the genome, a an additional step of Southern blotting needs to be performed. Zhang et al, however, developed a novel approach to analyze the mtDNA in “single” step. The method employed for the 1-step technique is to first enrich the entire mtDNA using amplification by PCR followed by massively parallel sequencing to detect point mutations as well as large heteroplasmic deletions simultaneously. A total of 45 samples were analyzed for the evaluation of analytic sensitivity and specificity. As stated by the authors “Our analysis demonstrated 100% diagnostic sensitivity and specificity of base calls compared to the results from Sanger sequencing” and added ” the method also detected large deletions with the breakpoints mapped”. Apart from the fact that the 1-step technique is less complex, the detection of point mutations has been found to be more accurate compared to Sanger sequencing that doesn’t provide any quantitative information and falls short of detecting heteroplasmy lying below 15%. Thus, the 1-step technique developed by Zhang et al has been demonstrated to be better than the combination of methods currently utilized for the detection of mtDNA mutations in terms of simplicity, cost effectiveness and accuracy.